Lawton Mainor Chiles, Jr. was an American politician from the U.S. state of Florida. He served as a United States Senator from 1971 to 1989 and as Governor of Florida from 1991 to 1998. Pair of Lawton Chiles' walking shoes on display at the Florida State Capitol. Lawton Mainor Chiles, Jr. (April 3, 1930 – December 12, 1998) was an American politician from the U.S. state of Florida. He served as a United States Senator from 1971 to 1989 and as Governor of Florida from 1991 to 1998. A Korean War veteran, Chiles later returned to Florida for law school and eventually opened his own private practice in 1955. Three years later, Chiles entered politics with a successful bid for the Florida House of Representatives in 1958, as a member of Democratic Party. By 1966, Chiles left the Florida House to run for the Florida Senate. Despite 12 years in the Florida Legislature, Chiles was relatively unknown when he decided to bid for United States Senate in 1970. He embarked on a 1,003-mile walk from Pensacola to Key West for his campaign, earning him the nickname "Walkin' Lawton". It was successful and Chiles defeated his opponent William C. Cramer by a 53.9%-46.1% margin. Chiles retired from the United States Senate and from politics entirely in 1989. However, supporters convinced him to run for Governor of Florida in 1990 against the unpopular incumbent Bob Martinez, and Chiles defeated Martinez by a 13-point margin (56.5% to 43.5%). 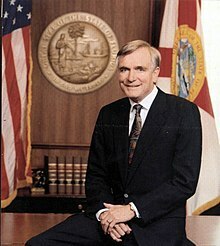 During his first term as Governor of Florida, Lawton Chiles brought reform to health care in the state and oversaw recovery efforts from Hurricane Andrew in 1992. Chiles faced a tough re-election bid in 1994 against Jeb Bush, who was a businessman and son of former President of the United States George H. W. Bush. Chiles prevailed over Bush by fewer than 64,000 votes. In his second term, Chiles was known for his reforms to education in Florida. On December 12, 1998, he suffered a heart attack and died at the Florida Governor's Mansion, leaving Lieutenant Governor Buddy MacKay to serve the remaining 23 days of Chiles' unexpired term. Lawton "Bud" Chiles III, the son of late Gov. Lawton Chiles, is making a late entry into the governor's race. Even close friends and associates of the Chiles family are urging "Walkin' Lawton" Chiles' son, Bud to drop out of the Florida Governor's race. March 28, 2018 (27-54) SUBSCRIBE to our YouTube channel and send us emails at SSMSnews@yahoo.com.